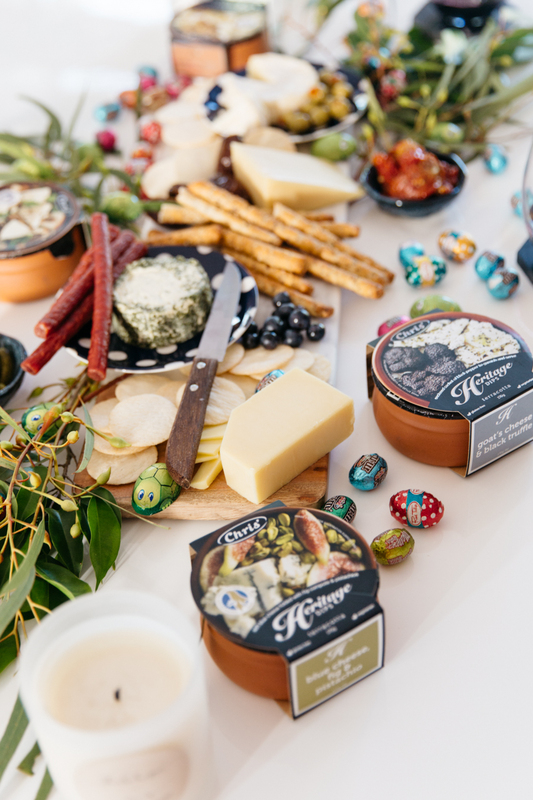 Taking the complicated out of Easter entertaining with Chris’ Dips Heritage range. Entertaining isn’t my forte. Entertaining is usually me inviting people over then getting everyone to introduce themselves while I fall asleep in my bed or completely forgetting about any plans I’ve made & going off to do other things while I leave my place attended with a bunch of people that don’t live there. I’m just as good at entertaining as I am with organising. Terrible. So I guess it’s kinda lucky I have like, no friends. This year, I decided to make an effort for Easter because as I child, we always got to enjoy fun Easter gatherings & I want my son to enjoy those same things. & I discovered, it’s not that difficult. 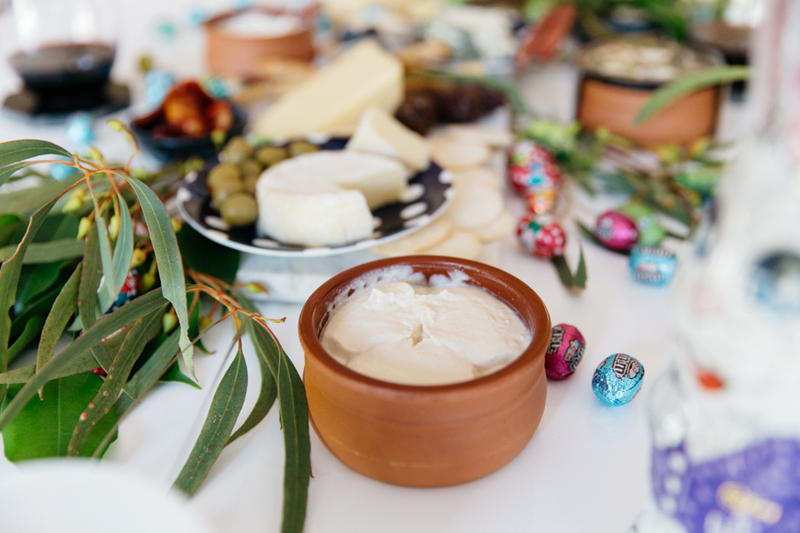 Especially when you have no friends to introduce to each other & a bunch of delicious dips which takes the effort out of everything. I mean, if I can put this spread together, then it’s really just a testament to how easy it is. I haven’t ever celebrated Easter in another country that really celebrates it but I can imagine that it would be different since most of the world, it’s during the Spring. But it’s Autumn here & we’re in Australia so I went with a rustic Aussie theme. It was made really easy with the terracotta pots the Chris’ Dips Heritage range come in. It’s good to know they’re reusable too. I’m planning to grow herbs in these pots when the dips are finished (which shouldn’t take long at all) & sit them along my window sill but there’s a bunch of ideas on how to reuse the terracotta pots on the Eat Love Share website. Not enough? There’s also a Heritage range of desserts too! 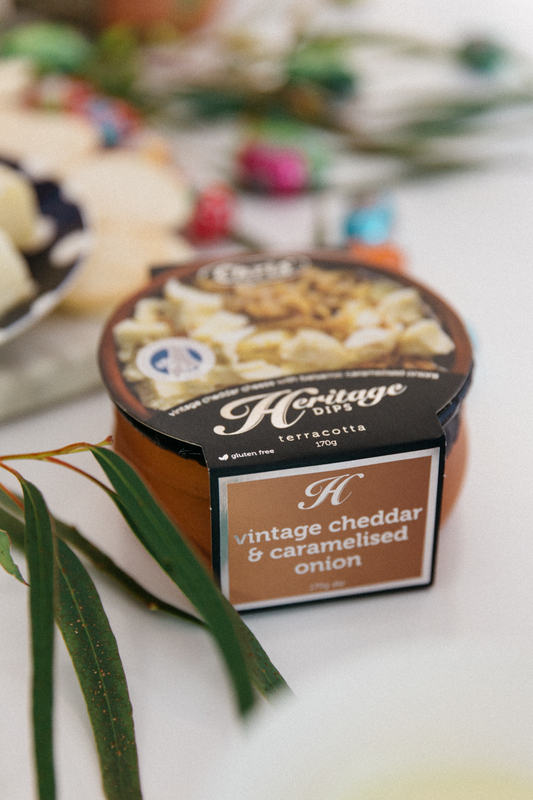 If you can’t tell from all the photos (&by looking into my fridge & seeing the gaping hole I’ve made in the dip pot), my favourite flavour of the Chris’ Dips Heritage range is the goats’s cheese & black truffle. It’s so creamy & I think I could slather it on anything. 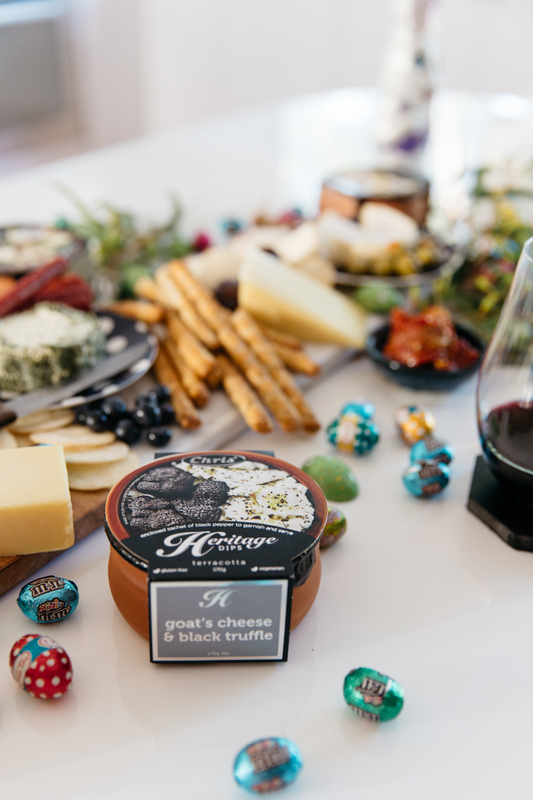 The other flavours are pretty damn amazing too & they all make perfect entertaining dips because of their luxe flavours & the cute pots they come in which basically takes half of the work of putting together a spread. 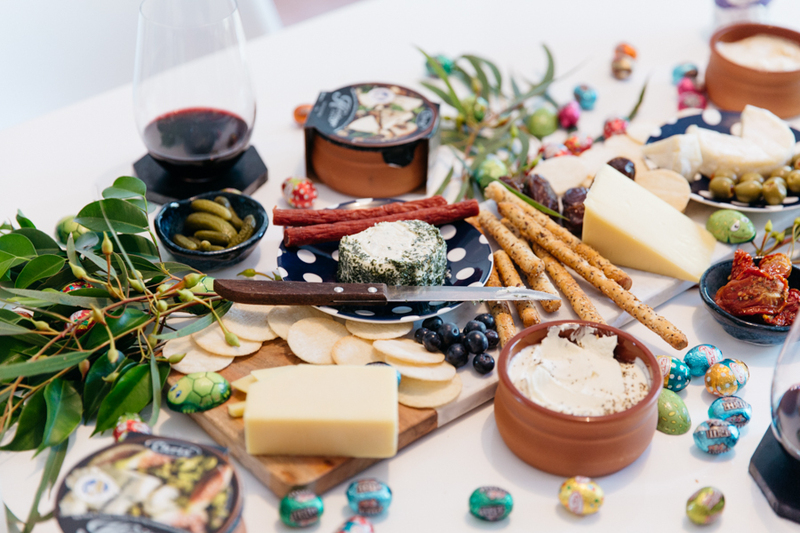 For this Aussie Easter entertaining spread, I used a marble board for the centre & worked around it. You can use any board that fits your aesthetic though. I grabbed a bunch of eucalyptus branches from outside & placed them around the board to give it a more rustic Australian feel. Tip: make sure you shake, wash & dry these out before hand. I couldn’t be bothered to do this step & ended up bringing a bunch of bugs inside then spent about 20 minutes screaming & shaking the branches out after my discovery. Ironically, wasting time instead. 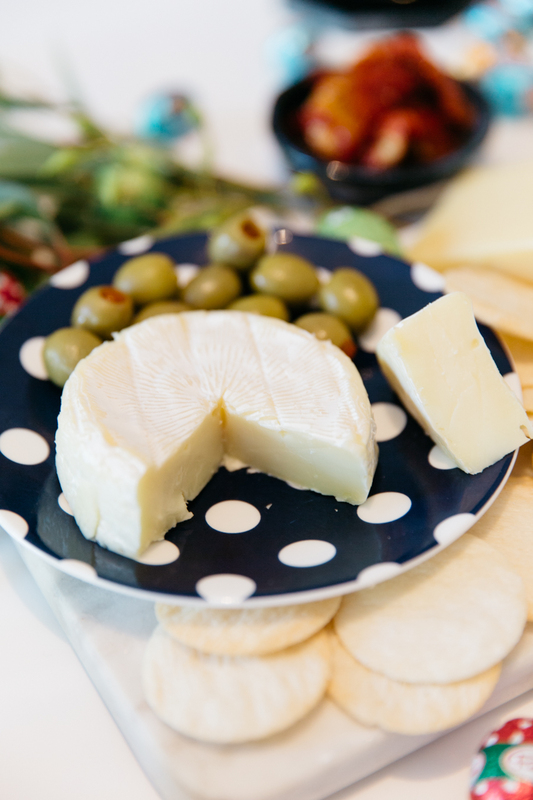 Place all your antipasto on the board & some around it. I used, baby pickles, olives, cheese (of course! 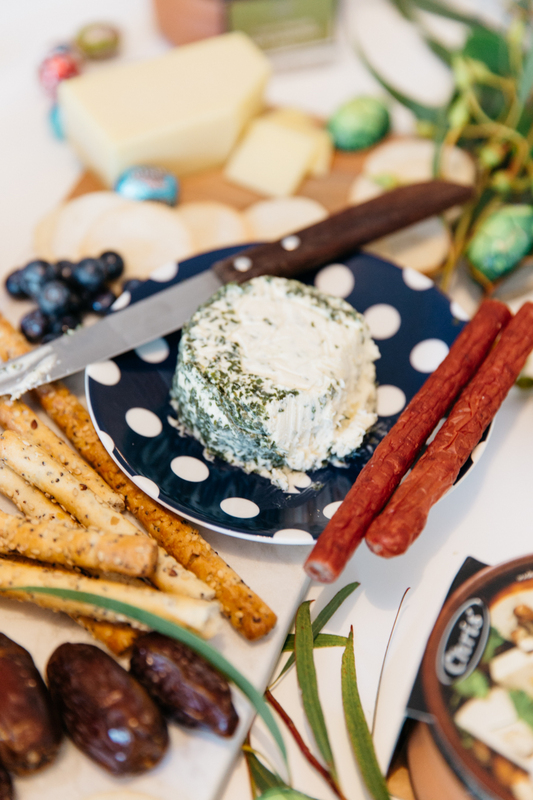 ), sun-dried tomatoes, fruit, crackers & breadsticks. You can use whatever you want though. 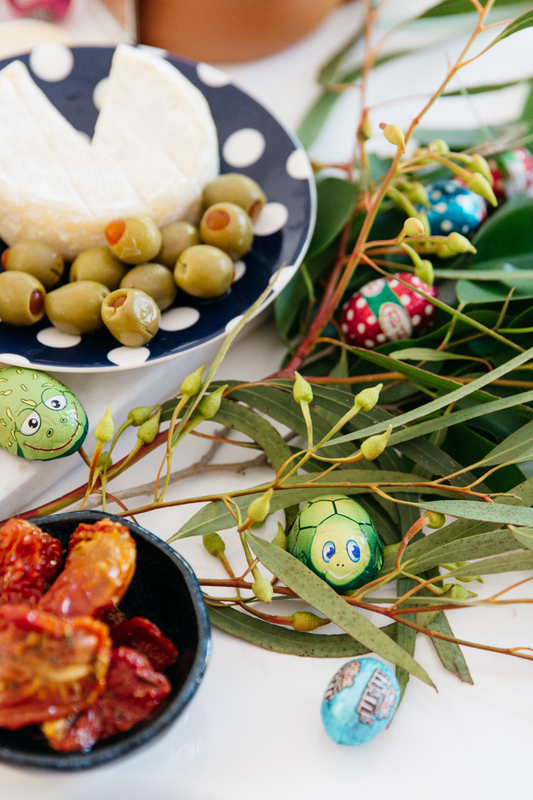 Lindt make these really cute animal chocolate “eggs” for Easter so I placed them in the branches & the Chris’ Dips around the table to go with the whole Aussie theme. Then light some candles & throw a bunch of chocolate eggs around the table because it’s Easter & Easter is all about sharing. & chocolate. But you already knew that.